Which would you rather do: Dump your wallet directly into a fast-moving river, or spend just enough of your hard-earned cash so that you can actually pull something out of the water? This post isn’t a 2 AM pitch for a dodgy investment scheme. 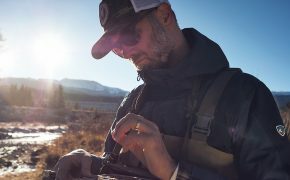 It’s a way to look at breaking into flyfishing without going overboard, or experiencing the overwhelm many of us did when we first got started and simply followed the advice of gear-sponsored fishing magazines. If you’ve read this far, I can safely assume you’re not planning to hop on a private jet to fish the Kamchatka Peninsula while breaking in your first rod and reel setup. I’d also like to think that you’ll do most of your fishing within an hour’s drive of home… or, at least, on water that’s easy to visit on weekends. Find out which local stream, river, pond, or lake has the best access and action, and tailor your gear from there. Find a local fly shop, and ask them to recommend a good spot and a good guide or, at the very least, a local flyfishing club. Experienced guidance from the beginning—even before you get your own equipment—is your first best investment of time and money. When you’re ready to make your purchases, support that fly shop, even if you have to spend a few more bucks in the process. Local fly shops are as much a resource in information as they are new toys, and thanks to major chain sporting goods stores, the mom-and-pop places are harder to find. This article will focus on good ol’ stream and lake trout fishing, but once you learn the basics, you can expand to larger inland species and even saltwater game fish. Rods, reels, and line are primarily classified by weight. The lower the weight number, the more sensitive the rod. Higher-numbered rods are for big fish and big water. The best all-around setups are usually 6 to 7-weight, medium-action combos, with the line weight matching the rod, wound on an appropriate reel. This weight class will let you land larger fish without having to wear them out too terribly, and still allow you the sensitivity to enjoy tussling with the little guys. If I were to say, pick just one, I’d tell you to get the best 6-weight, 9-foot four-section take-down rod you could afford. My recommendation is just a pound above what the author pushes in his excellent rod buying guide in Telluride Angler, but they’re looking at it from a three-rod arsenal-building approach. If you’re in it for the long haul, you can always sell the six and diversify. Don’t spend more than a hundred bucks on your first reel. Ever. 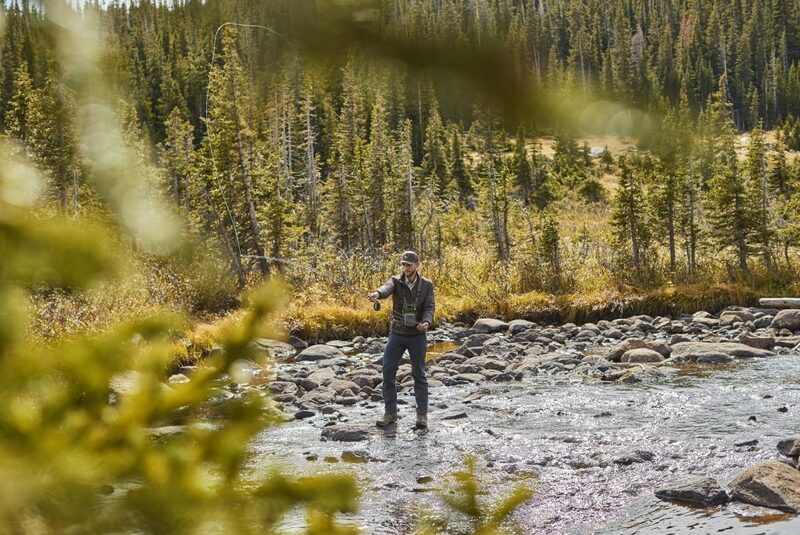 Orvis has a very versatile product in their Clearwater series that will put you well below that mark and defend its place in your kit long after you’ve gone well off the rails as a fancy-schmancy gear junkie. Spool up your reel with a good-quality weight-forward floating line matched to your rod weight. You’ll be able to fine-tune the line’s capabilities with the right leader and tippet selection. Have a pro load up your reel, and ask her to explain each step. You’ll also need backing, a few sinking and floating leaders and a selection of tippets. Backing, very simply put, attaches the reel to the line while helping it sit properly on the reel, and gives you a reserve when you play out your actual 30-foot fly line. Leaders connect the working end of your fly line to your tippet, which is the delicate filament two which you tie your fly. The latter two greatly affect your fly presentation, and all three are relatively cheap so get the best you can afford. Flyfishing in KÜHL FIREFLY HOODY. Ah, the floppy-hatted, khaki-clad fisherman (yes, man) on the cover of vintage sportsmen’s (again!) magazines. Wicker creel and all. While you don’t have to emulate the look, it isn’t all for show. Quick-drying pants with a few extra pockets are the way to go. I like convertible cargo pants with a little bit of elastic in the material. I’ll throw on a UV-resistant long-sleeve shirt, with a minimum UPF 20 rating. Bonus: The long sleeves are helpful for when the bugs start to bite in the evening. Khaki or other neutral colors help you blend in to the surrounding environment, reducing the chance you’ll spook shallow-water fish. A good hat will prevent sunburn and save you from getting nailed in the scalp after a sloppy cast. I have long hair, which I braid or put up in a pony tail to avoid snarls. If you’re a long-haired guy, go ahead and do the man-bun thing; flyfishing is probably the one circumstance where nobody will make fun of you. 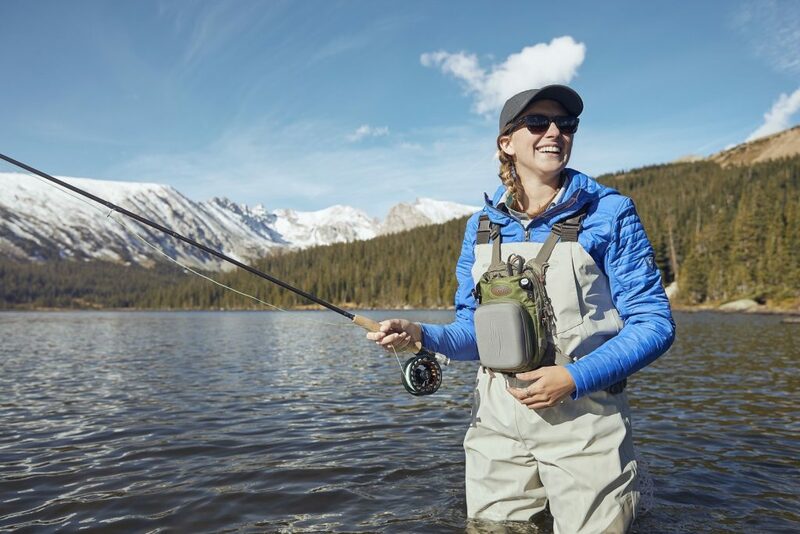 Polarized shades reduce glare and help you spot the fish, but even in low-light conditions, a pair of clear glasses will protect your eyes from wayward hooks. If you’ve got older eyes like mine, do yourself a favor and get some bifocals or readers that connect at the bridge with a Croakies-style neck strap. They’re even available with polarized lenses. You’ll be making lots of tiny little knots through itty-bitty hook eyes, and frustrated screaming will scare the fish. Finally, UV-preventative neck gaiters are all the rage right now, and can add an extra layer of protection against—you guessed it—murderous hooks. If you’re on water where you can legitimately keep your catch, a creel is nice but I’ve never once seen one unless it’s holding fake flowers and perched on the mantle of a B&B fireplace. 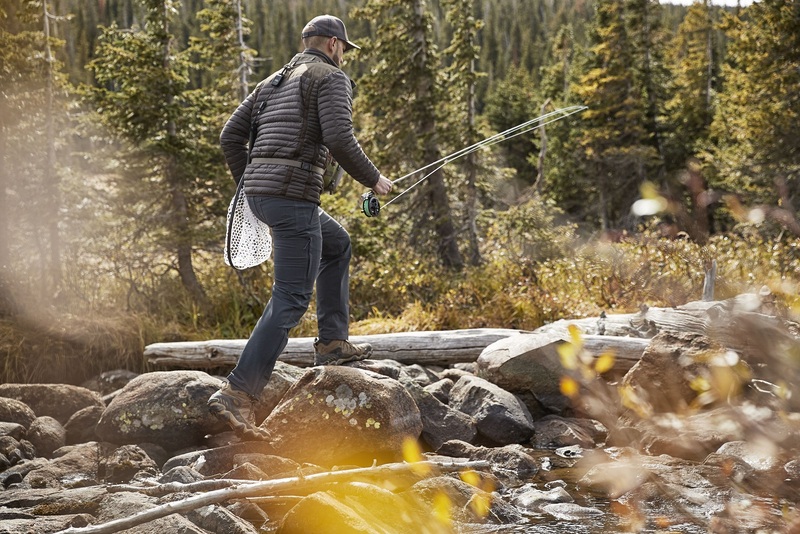 Most flyfishing vests have a pouch in back where you can stash your catch, or you can use a stringer or cooler after humanely dispatching the fish. You will be covering more ground than you would baitcasting or worm-drowning, so keep that in mind if you plan to stash stuff on the bank. Do you really need a vest? That’s a personal choice. Waist packs are another popular option, or you can just keep a few flies and basic tools in pocket cases or fishing wallets. I like being able to hang my net and my folding wading staff from the vest’s collar loop. The problem with vests is that I tend to overload them. Waders and boots are a must, but not right away. You can do plenty of fishing from the bank, or in shorts when the water’s not numbingly cold. When you do get overall-type waders down the road, be sure to wear the belt to prevent them from getting swamped should you wipe out on a slippery rock. In heavy-flow rivers, I wear a self-inflating PFD just in case. 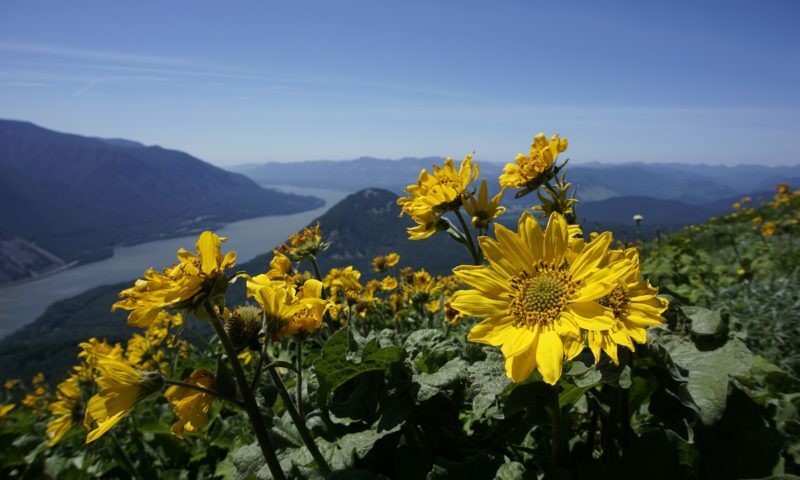 If you have an old ski or hiking staff, bring it with you until you’re ready to spring for a collapsible wading staff. Fingernail clippers on retractable cord: For clipping excess tippet after you tie on a fly. Now, you can spend $20 to $80 on specialized, high-quality flyfishing nippers, but… why? As long as they’re sharp, they’ll work just fine. Hemostats: These are the serrated scissor-shaped clamps doctors use to stitch up your hand after you’ve goofed with your filet knife. Anglers use “hemos” to hold the fly by the hook (or to mash down a barb). Hemos are also handy for removing the hook from the fish’s mouth, or from your earlobe. Floatant: A fluid, powder or gel that helps keep the dry fly sitting in the right position on the water surface. Line dressing: When you can’t give your line a deep-cleaning, put a few drops of line dressing on a bit of cloth or tissue and strip the working section of line through to remove dirt. This helps protect the line’s integrity, and keeps it bouyant. Pre-moistened pads are very handy. I take this step at the end of every session… if I remember to do so. Certainly after every second or third. Sturdy safety pin: Groom your flies and poke dried acrylic from hook eyes with something sharp and pointy. Some fancy nipping tools come with a pin, but it’s always a good idea to have a backup. Avoid shiny stuff. Black or earth-toned powder coating on your forceps and nippers can freak out the fish when you’re switching flies while wading or close to the water’s edge. But don’t sweat it when you’re just starting out; upgrade as you go. Adams: Possibly the most popular dry fly ever, and with good reason. Elk-hair caddis: A highly-adaptable light-colored dry fly. Griffith’s gnat: Trout eat a lot of gnats, and they’ll eagerly go for these. Royal Wulff: When the elk-hair caddis or Adams aren’t producing, this fly might do the trick. Pheasant-tail nymph: A mid-water wet fly that imitates emerging mayflies. Prince nymph: Like the pheasant-tail, but with a little more bling and contrast. Woolly bugger: Stock up on both olive and black to imitate leeches among stony river or stream bottoms. This is the first pattern I learned to tie. These should cover your bases for color, shade, and water position. Once you get the hang of presentation, you’ll be switching out your flies fairly regularly until you figure out what the trout are hungry for. This is where “matching the hatch” comes in: select the pattern that most closely resembles the “naturals”—the insect species that are out and about at the time. 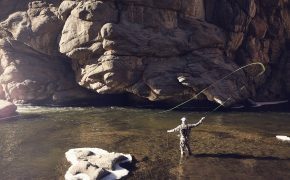 Master basic flyfishing techniques using minimal equipment before you move on to different weight combinations. It’s easier to develop muscle memory and casting skills on one set of equipment than on three specialized combos. In the meantime, you’ll develop your own preferences for carrying and using your accessories, flies, and tools. And if you decide the sport’s not for you, you’re not out a whole lot of cash… though you might be out of your mind.